Ah the beet, queen of spring and fall vegetables! In my opinion, she has few competitors in gardening value. She is easy to cultivate, and stores nearly indefinitely. She also packs a heck of a nutritional wallop; and in terms of sugar content, lusciousness of color, and sheer culinary versatility, she is a vegetable in a league of her own. Beets can be roasted, steamed, candied, pickled, whipped, pureed, or gnoshed straight from the ground raw. The young leaves beautify crisp salads and the older ones can be wilted, stuffed, or even used as wrappers for steamed meat dumplings. 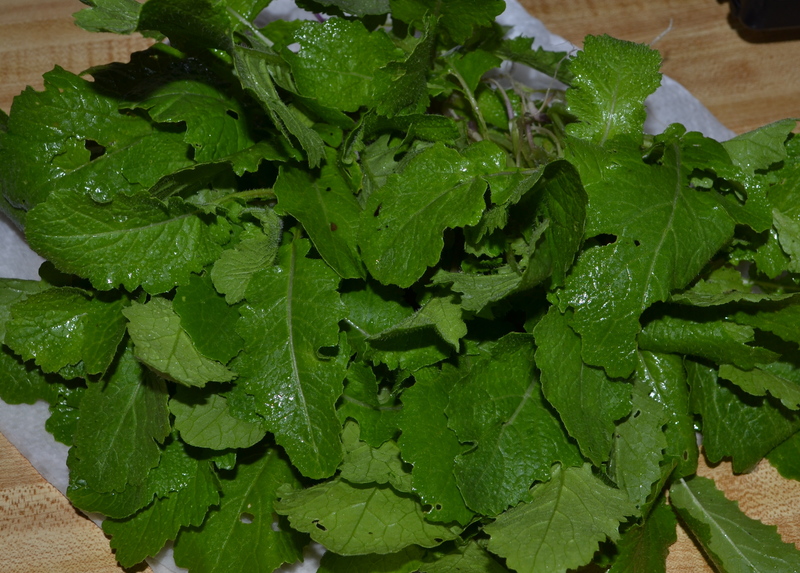 These are this year’s crop of spring turnip greens! My 13 year old and 6 year old planted them for me. Turnips are actually an autumn crop. They need the shock of a good hard frost for the beautiful white/purple roots to develop a proper sugar structure. They also store in the garden bed nearly all winter, regardless of outdoor temperatures. 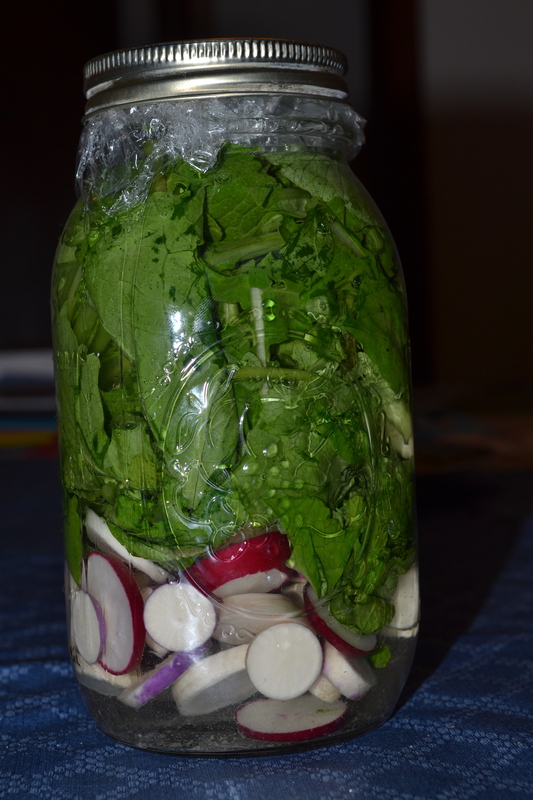 Turnips produce some of the the earliest of all garden greens. I can’t help myself: even though I plant turnips in the fall for the roots, after a long drab winter, I am dying to eat something fresh and crisp and green. I always plant at least a small patch to “get me through” the early spring until the later greens — spinach, beets, and chard — are ready for harvest. Turnip greens have a more fibrous “structure” than spinach leaves (which in any case won’t be ready in the garden for another two weeks or so). 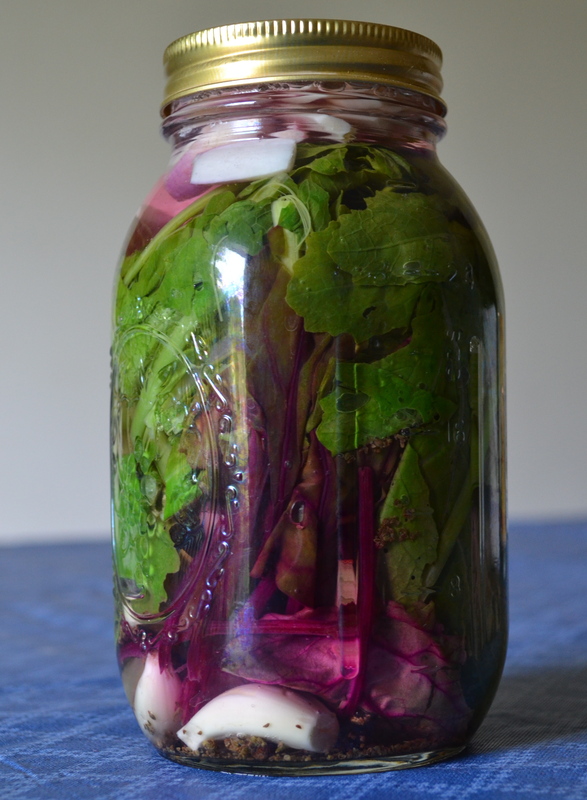 Unlike their cousins mustard and kale, which are tougher and more bitter, turnips remain tender when harvested early, before the roots have developed. 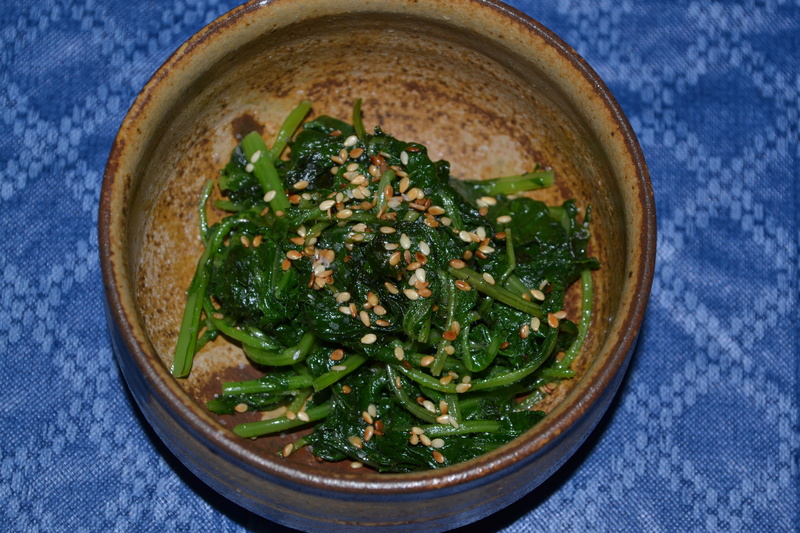 This “structured tenderness” makes them perfect for a traditional Soul Food dish, “wilted greens.” The particular recipe, however, is influenced by my years living abroad in Japan. I’ve replaced Soul Food’s reliance on fat from pork with sesame seed oil, while retaining Soul Food’s cider vinegar finish. This is a fast, low-calorie, high nutrient dish that tastes good with rice and grilled fish (the Japanese way) or with corn bread and fried fish, the African American way. Try it both ways, first one and then the other! “Some” very young, fresh turnip greens. Maybe 1/4 lbs? Whatever — be sure to choose bunches in the grocery store with the smallest leaves, rather than the largest leaves. These leaves cook down by a LOT. If you want several servings, you will need to purchase this in volume. Wash your turnip leaves very carefully. You don’t want to eat wilted grass. Ask me how I know. Wait. Don’t. Discard damaged leaves and very long stems. 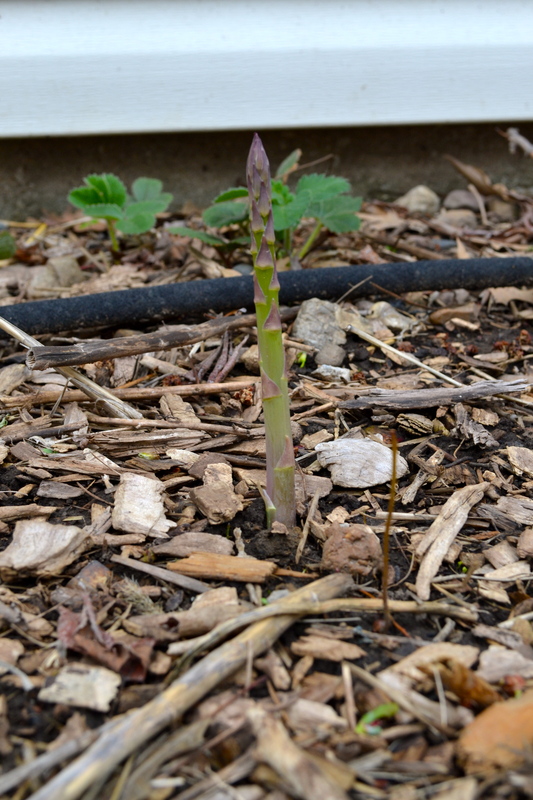 It is okay to leave the shorter slender stems. Snip off any roots. 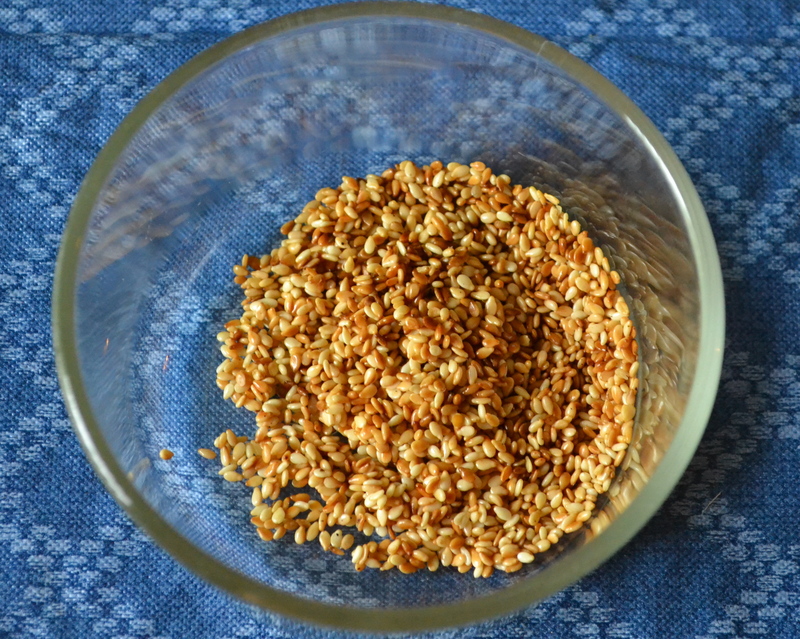 Toast your sesame seeds in a dry skillet. Shake them in the bottom of the skillet so they don’t scorch. While your turnip leaves are drip-drying, lightly toast the sesame seeds over a medium heat in a cast iron skillet. You can do this in the oven on a cookie sheet, if you prefer. Peel and score a whole garlic clove. Do not mince. Rub the inside of the skillet with the garlic clove while the skillet from the sesame seeds is still warm. Be sure to press firmly to express the garlic oil. Leave the clove in the skillet, and then reheat the whole thing over a medium-high flame or burner. 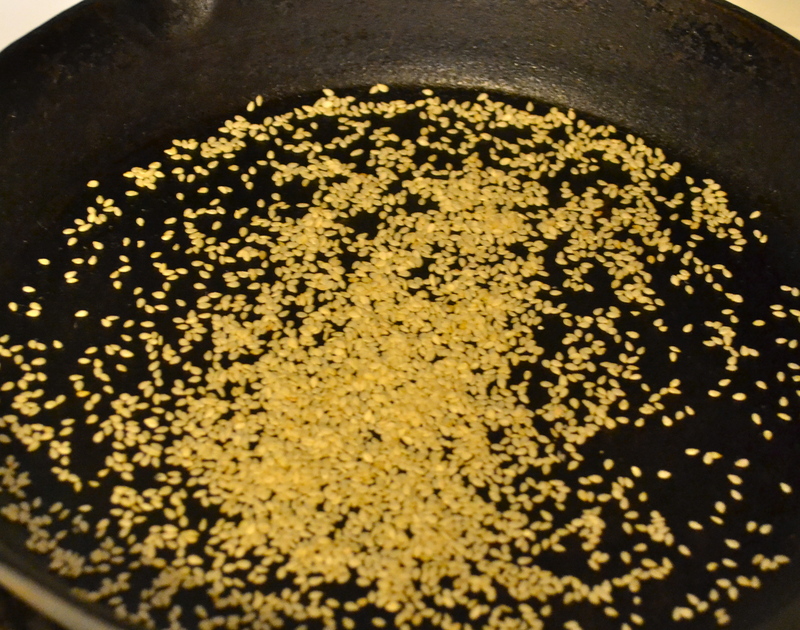 When the skillet is hot enough to bring oil to stir-fry temperature rapidly, add the sesame oil. If the sesame oil does not achieve stir-fry temperature immediately, WAIT for the next step until it does. Add the turnip leaves all at once, even if it fills the entire skillet. 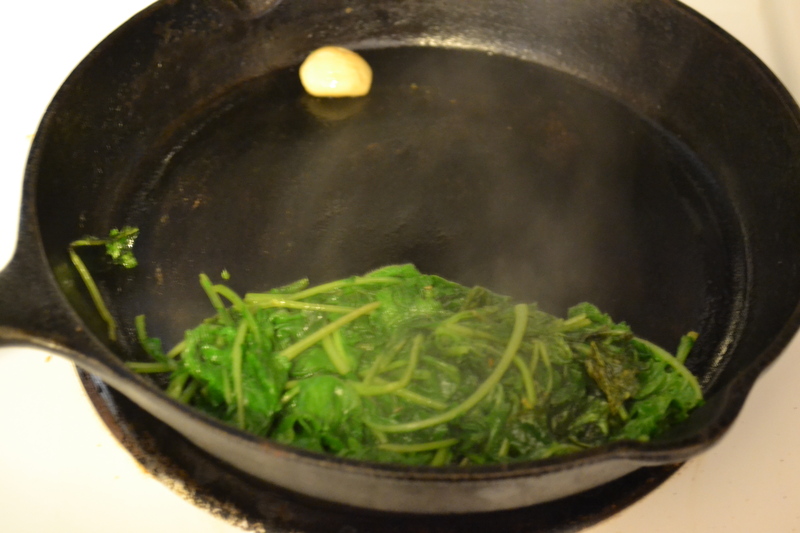 If you have more leaves than your skillet can hold, continue to add leaves as the bottom layer of turnip greens wilt. This happens very quickly if your skillet is hot enough. Stir as you add your leaves to prevent the bottom layer from scorching. Do not put a lid on your skillet to wilt the leaves by “steaming.” This will make your dish turn out watery. Separate out the garlic clove after the majority of the leaves have wilted. Transfer your wilted greens to their serving dish. 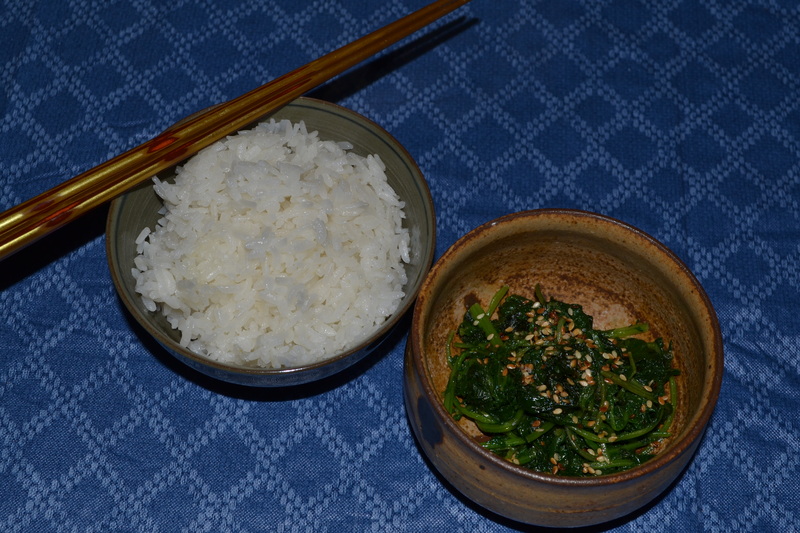 Drizzle 1/3 tsp of cider vinegar over the greens, and garnish with toasted sesame seeds. Add the dash of sea salt at the very end. Serve as a side-dish. I like mine with grilled fish and steamed rice. Try it! Enjoy it!